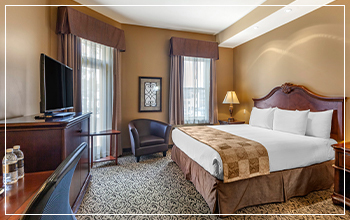 Our Deluxe hotel guestrooms offer luxury and comfort in Stratford, Ontario. At approximately 260-300 square feet, these spacious guestrooms are perfect for a family getaway, overnight conferences or an extended romantic escape in the heart of our eclectic downtown. Transform your weekend away into something spectacular by booking a room that will exceed all of your expectations. The Parlour Inn’s beautiful guestrooms, conveniently located within walking distance from our world-renowned theatres, exude old-world class alongside upscale modern amenities. The large windows let the sunshine in and give you and your guests a view of Stratford’s lively city centre. Each room also includes a desk that will easily fit your laptop and work documents, making this room the perfect mix of luxury and utility for our business guests. Explore the sights, tastes, and culture that make Stratford a perfect tourist destination. Afterwards, catch up on work in this exceedingly comfortable hotel room while still enjoying an uplifting view. 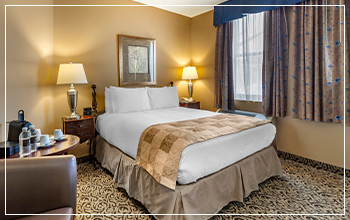 Choose from a Deluxe Room that offers two Queen Beds or one King Bed. Take advantage of the extra floor space by ordering a cot to your room to accommodate an additional guest. 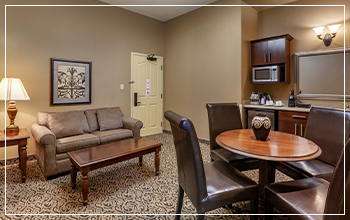 This room’s size and layout make it more accessible* to guests who may have limited mobility, so you can feel comfortable bringing all of your family members along for your Ontario adventure. Our Deluxe Rooms include a mini fridge and coffee maker, helping you to enjoy a late night snack or early morning caffeine boost before a big day on the town. The bathroom is equipped with a whirlpool soaker tub, elevating your quiet time after a dramatic matinee or lengthy conference. 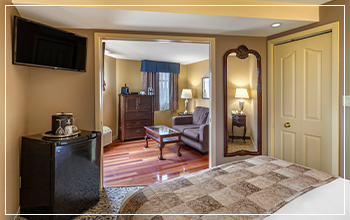 Book a Deluxe hotel room at The Parlour Inn to enjoy upscale accommodations with an award-winning onsite restaurant. Experience the best of Stratford without ever having to get in your car. Shop, dine, exercise, and relax in and around our historic hotel. 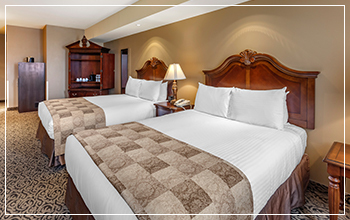 Book now or contact our concierge to reserve a Deluxe Room in Stratford, Ontario. 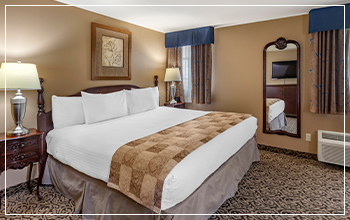 *Accessible rooms are also available in rooms with 2 Queen Beds for added maneuverability and convenience.